So, even though you felt you’d done everything you could with Ocarina of Time, Majora’s Mask came out of it. Now, in the same way, you progressed from Phantom Hourglass into making Spirit Tracks. That’s right. After we made Ocarina of Time, and Miyamoto-san said, “There are still things you can do, aren’t there?”… I think those words came back again, inside me. It really is. (laughs) Now that I think about it, it’s a rather inhumane story. Iwamoto-san, do you mean your producer urged you, “We got Majora’s Mask finished in a year, so come on, let’s do this in a short time frame, too”? Besides, this game had a two-year development period. 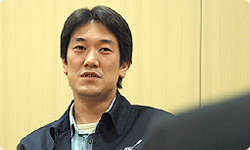 To begin with, Director Iwamoto was on the Ocarina of Time staff as well. I’ve been involved in the Zelda series since Ocarina of Time, but I wasn’t in charge of Majora’s Mask. So I didn’t know how rough Majora’s Mask really was, and when Aonuma-san said, “There are still things to do here, aren’t there?”, it didn’t really upset me. Since you felt you’d really done your best, then, you also felt that you could keep going. Right. We thought, “What if we go at this using a different approach from the previous game?” And what we came up with was the use of the Phantom . controlling the Phantom at a relatively early stage. We’d been trying to think of a method for intuitively and easily controlling a sub player for a while at that point. In other words, even before you were told, “There are still things to do here, aren’t there?”, you’d had an idea that you really wanted to try. That’s why, when I said, “Let’s do another one!”, I got such a good response. Something in each of us sort of resonated with the other. By the way – and I’m asking this because history does tend to repeat itself – was there an argument before this game, as there was with Majora’s Mask? I don’t think either of us really tried to pick a fight… Did we? Only, Iwamoto-san directed Phantom Hourglass, but it wasn’t a completely original work as far as he was concerned. That’s true. We had The The Wind Waker 9 to start from, and we also did things like bringing the boat play over to DS. 9 The Wind Waker is “The Legend of Zelda: The Wind Waker”. It is an action-adventure game for GameCube, originally released in December of 2002 in Japan and May of 2003 in Europe. I see. Phantom Hourglass felt quite original to me, but the boat parts are similar at their base levels, and they were expressed through the application of a method you created for The Wind Waker. Even as he applied it, he searched like mad for things he wanted to tinker with and improve from The Wind Waker. And the results really paid off for Phantom Hourglass. So for Spirit Tracks, I think he wanted to be free to make things he’d thought of on his own… Is that about right? Then, among the characters who appear this time, we really focus on Princess Zelda . Tetra showed up in the last game, didn’t she? (laughs) But it wasn’t that I didn’t like her so much as that I was enthusiastic about characters in my own way. I was searching for something that hadn’t been portrayed much, and there was Princess Zelda. At first, we hadn’t settled on the sub character, and I discussed several things with the staff. Then we thought that, since they’re adventuring together, it would be better to have it be a girl. But, you know, we couldn’t have it be Tetra every time, so we started to consider introducing a new character. The thing is, though, it’s “The Legend of Zelda”. I thought it wouldn’t be much fun if Princess Zelda didn’t show up and if we brought in some unrelated princess instead, so, in the end, I asked for permission to use Princess Zelda. 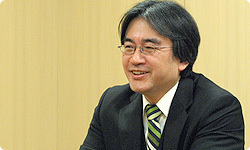 And what was Aonuma-san’s answer? What!? I didn’t say it like that! I said, “Why don’t you try it?” Politely. Didn’t I? Oh, quit making trouble for me… (laughs).